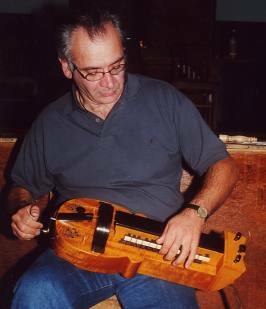 We offer quite a variety of options on the Minstrel, especially for an instrument of its small size. This page and the pages explaining the specific options will help you to choose the ones that are appropriate to your playing level and style, your budget, and your future plans for your instrument. Trim pieces: These are the pieces that are on top of the instrument: the keybox top, the wheel cover, the tailpiece, and the wheel cover blocks. Black walnut is the standard choice. Options include wenge, ebony veneer, and a variety of specialty hardwoods. These pieces are the most likely to be decorated with custom inlay. Custom inlay: The standard choice is that the instrument is unadorned, as we prefer to let the beauty of the natural wood speak for itself. A variety of inlay examples are shown in the options page. Some decoration ideas that we have thought of but haven't gotten to try yet are described in the Flights of Fancy page. S-shaped crank: The standard on the Minstrel is a straight crank. The option is the traditional S-shaped crank. Drapeau: This drone capo or pair of capos are not included on the standard Minstrel. Marcello Bono signature model: This is a package of options which brings the Minstrel to Marcello Bono's specifications.